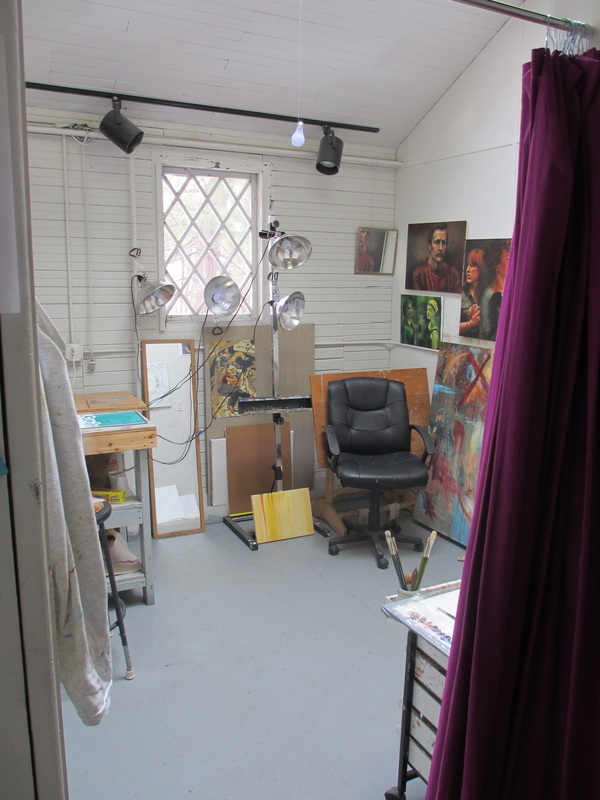 The Hive is a Community Art Center in Gloucester that focuses on providing opportunities to create art for high school students and adults through classes and artist studios. The gallery space is newly renovated and the Center looks forward to many more art shows and openings in this beautiful space. Momentum Gallery is excited to partner with the Hive for its opening because it stands for the same principles of supporting local artists and facilitating a creative culture on the North Shore that Momentum does. Our artwork will be hanging in the space from May 25 to June 15. 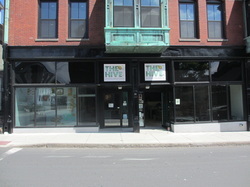 The Hive is open weekdays from 10-5. Visitors on Saturday and Sunday should call the center to find out the hours the space will be open. On May 25 from 6-11, visitors are invited to get a first look at Momentum Gallery's art work while listening to local bands. There will be a five dollar charge at the door to support the music. Please join us in celebrating local artists on the North Shore! 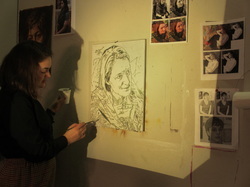 Katie Joy Nellis is a Senior Art Major at Gordon College who let Momentum Gallery get an early look at her thesis work. Katie Joy’s studio is full of faces. Through photographs, sketches and paintings, she has surrounded herself with a myriad of expressions and features – fascinating images of important figures in her life, many of them painted by Katie. As an artist, Katie has always been attracted to the magnetic power of faces. Through studying and painting portraits, she is exploring a narrative that reaches far deeper than simply a physical likeness. This probing exploration can be witnessed in the deeply beautiful portraits she paints of others. A portrait Katie painted of her brother was in a show at a gallery in Peabody. It is an enigmatic but simple image of his profile with an orange cloth wrapped around his shoulders, dark hair pulled into three small ponytails in a line on his head. He occupies about half of the horizontal canvas while the other half is filled by the atmospheric light blue background, which is pierced by several shocking drips of red. Visitors to the gallery were drawn to this painting right away. I think in part it was because of the beautiful craftsmanship of Katie’s painting, but it also to do with the image itself. It was so intimate and yet so frustratingly mysterious- Katie had included enough to give the viewer an introduction to this character, but had obscured and hidden these details in such a way that the viewer was left wanting to know more, straining to find clues about this arresting subject. When explaining how she chose different faces to paint for her senior thesis, Katie explained that they were friends who had been present throughout her college career- friends she knew and loved too well not to describe through painting. While painting each person, Katie Joy immerses herself in his or her world. She has extensive interviews with her subjects to understand more about what inspires that person. The music that the subject loves is the background noise to every studio session. These details manifest themselves in the features of each figure through the subtle details of expression and gesture. 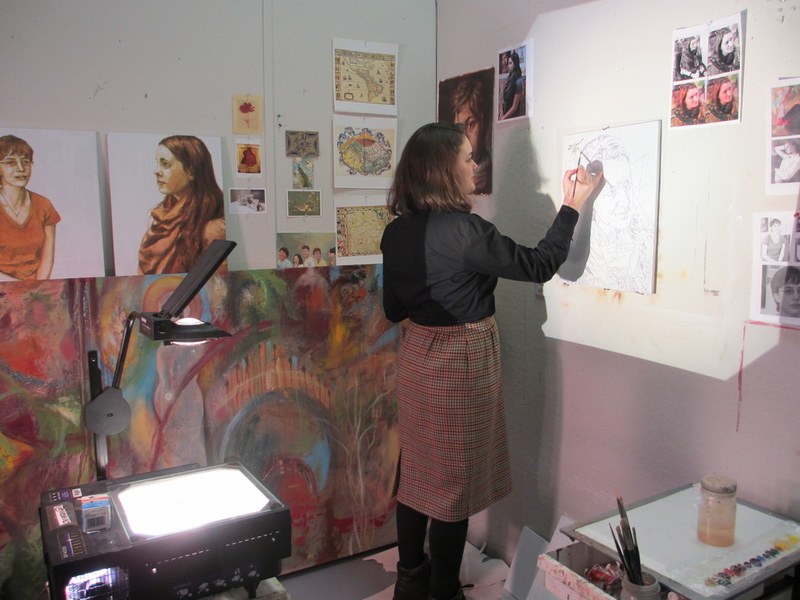 In her thesis show, Katie plans to include intricate drawings of objects and figures inspired by each interview to aid the viewer in truly seeing the face in the portrait. Color is an important part of Katie Joy’s painting process. As she showed me around her studio, she pointed to one particular painting. “I don’t know how,” she said, “but this turned out to be very red.” Later she worked on the very skeletal beginnings of a portrait by drawing in the contour lines of the face with a forest green. Colors, like the intimate details of a person’s life, show up in surprising and often vibrant ways in the painting- they act as another way of capturing the personality and emotion of a subject in the moment they are being studied. In Katie’s portrait of her brother, for example, the balance between the vibrant orange and red with the soft blue denotes both energy and calm in the subject, humor and depth. That is what makes Katie’s portraits so beautifully complex and intimate: layered within every tone and line of each feature is an insight into the character behind the face. Katie Joy handles all of her subjects with this same attention and care, inviting her viewers to look more closely and notice how beautiful and interesting the life behind an individual’s face can be. The name "Momentum," meaning the impetus gained by a moving object, describes exactly what this gallery is trying to achieve. Momentum. We believe that with a little push, we can set in motion partnerships and projects with enough mass to keep on rolling and gaining speed. We want to give new artists the support they need to continue creating and sharing their work. The work of graduating seniors represents emerging talent that rarely gets the attention it deserves. It is the result of years of thoughtful training and refining to achieve a style and body of work that is truly powerful. We hope to give these artists the initial thrust that allows them to keep working, exploring and growing. We want to give members of the community the chance to view and collect quality original art without sacrificing their budget. It is an opportunity for people with the desire to support local artists at the beginning of their careers and to collect meaningful works of art to start building a collection. We hope that this collection grows and fosters a lasting appreciation for thoughtful and original works of art and an understanding that quality comes in all sizes and prices. We want to become active participants in the arts community in the North Shore of Boston. By partnering with Art Haven in Gloucester, we not only are proud members of the established art culture in Gloucester but are collaborating with an organization that fosters creative growth and exploration in the younger members of the community. This gallery can be part of the push that brings forward motion to creativity, culture and innovation in our community. We invite you to join us in the movement. 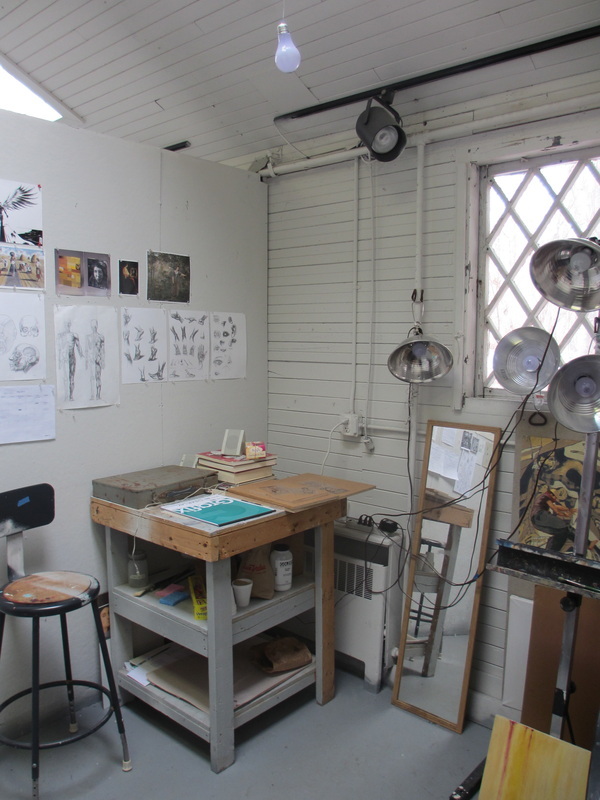 A Gallery exhibit in Cape Ann Art Haven featuring the work of graduating artists from art programs in North Shore colleges.